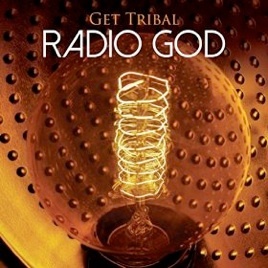 Radio God is the follow-up to Get Tribal’s award-nominated 2014 debut, God of Drum. 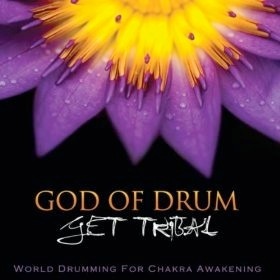 Get Tribal is a band headed up by Kari Hohne that features various percussion instruments front and center. That isn’t to say that this music is just about drums and rhythms - there is a broad range of ethnic, traditional, and electronic instrumentation in the music and an even wider variety of musical styles that are influenced by ancient wisdom and healing customs. Hohne has worked extensively on archetypes and has studied with shamans all over the world. The compositions are centered on ethnic rhythms that inspire the same type of awakening that shamans seek. Hohne explains: “Each track is designed to awaken the energetic body, igniting consciousness with inner wisdom. We strive to create meditative openings in our music and seek to energize the emotions.” Described as “perfect for yoga and exercise,” the music was inspired by the idea that if all music, past and present, returned as sound waves from space, the melody would play as a timeless and universal message of unity: Om. Often quite hypnotic, several of the tracks just might get you up on your feet to move your whole body. At the very least, I can guarantee that toes will tap! Each of the ten tracks on Radio God represents a different radio station. It begins with “GUIP: Sunrise,” which is a unique combination of Eastern European Gypsy folk and Southern Baptist Revival music. “RUAH: Breathe” is one of my favorites and is Hebrew chant set in an MGM Bible movie soundtrack tapestry. Mysterious and dramatic, this cinematic piece features keyboards (including piano), strings, and orchestral percussion telling a story that is both dark and reverent. “BEJA: Elegant Flow” is Baroque-style composition blended with easy listening 70’s music. The driving rhythm of the drums and the intensity of the strings keep this one moving - “going with the flow.” “TABA: Out of the Underworld” mixes musical influences of ancient Mesopotamia with dholak percussion and elements of 1960’s spy cinema soundtracks. Very dark and intense, the piece was inspired by the image of Imhotep’s face coming out of the sand in the movie Mummy. “Radio God: Into the Outerworld” asks the questions: “What is the music we have made with our industrial sounds and telecommunication signals?” and “What is the sound of the void we seek to transcend when looking for our reflection in the face of the One?” Driving rhythms, heavy drumming, and deep bass drones mixed with electronic sounds and instrumentation make this piece both compelling and a little bit frightening - also a favorite. “ANKH: Dancing Desert” is a mix of Middle Eastern Dervish with 1980’s disco and action soundtracks and is all about the DANCE. Bright and energetic, this one will have you grooving in your chair if you aren’t up and swirling around the room! So, you can see that Radio God is a unique and very unusual listening experience! It is available from Amazon, iTunes and CD Baby. Recommended!